When I made my Top 10 of 2010 list a few weeks ago, there was a good reason for it. I had just watched Scott Pilgrim vs The World, which was the last of my major must-see films for the year. At that point, I felt confident in making a list I could get behind to an acceptable degree. So even though it came more than 8 months after 2010 ended, it felt warranted. Justifying a Top Ten of 2009 list when we’re fast approaching 2012 is trickier. In fact, there’s always a certain degree of guilt involved in making any list. They’re “easy”, both to write and to digest. The blogging world is swamped by them. They’re not worthwhile content. Why rank movies at all? And so on and so forth. The reason for me doing this is that I think yearly top ten lists are a good way to get a feel for what a person’s taste in film looks like. When I come across a blog that’s been active for a few years, I often check to see if they have any lists of this sort. I enjoy seeing what people have picked, and sometimes I’ll get alerted to films I haven’t heard of before, or am pursuaded by someone’s enthusiasm to check out a movie I might have dismissed earlier. For me, reading them serves a purpose. And thus, me writing them might provide some of you similar benefits. Since this blog isn’t very old, there hasn’t been time to provide any yearly lists like this. So I’m doing them retroactively, one year at a time, moving back through the years. I don’t intend to drown you in them, mind you. Maybe one every couple of weeks or so, when I feel like updates have been a bit slow and I can’t come up with anything more interesting to write about. Regardless, I hope you’ll enjoy them in one way or another. So. 2009. Not my favorite year in terms of movies. Plenty of films “very good” but not “great”, a whole bunch of let-downs and a couple of real stinkers (supreme bore-fest 2012 and painfully unfunny Year One chiefs among them). The real highlights were scarce compared to other recent years. Nonetheless, the ten films listed below all endeared themselves to me in one way or another. I can look at this list and really like what I see. This is 2009 strictly as listed on IMDB, by the way. And please do keep in mind that these are my favorite movies of the year and nothing more. Every year, there seems to be one bright new young starlet who arrives on the scene from out of nowhere. 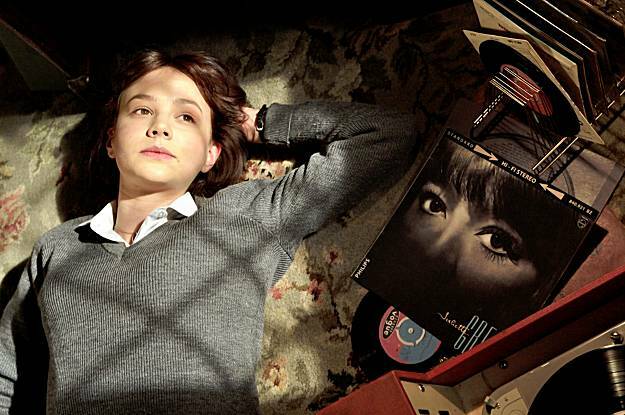 In 2009, that actress was Carey Mulligan. She’s thoroughly convincing in the touching coming-of-age drama An Education, playing 16 year-old Jenny in 1960’s England, a girl tired of the world she’s in who finds herself whisked away to a life of romance and glamor by a charming stranger (Peter Sarsgaard). Not the most unique of stories, but one told exceedingly well. Also features a great supporting turn by Alfred Molina as Jenny’s father.